A native of Korea, violinist Hae-a Lee moved to England at the age of three. She won a scholarship to attend the prestigious Chetham’s School of Music in Manchester, studying with Roger Raphael. She attended St Hilda’s College, Oxford University, to read music and continued private lessons with David Takeno. She moved to the USA in 1990, initially to Florida and then to Texas. Now a Houstonian, Hae-a is a member of the Houston Grand Opera Orchestra and Mercury. She has played on numerous recordings with both organizations in addition to Ars Lyrica Houston’s Antony and Cleopatra by Hasse, which was nominated for a Grammy in 2010 (the only US recording in the Opera category). 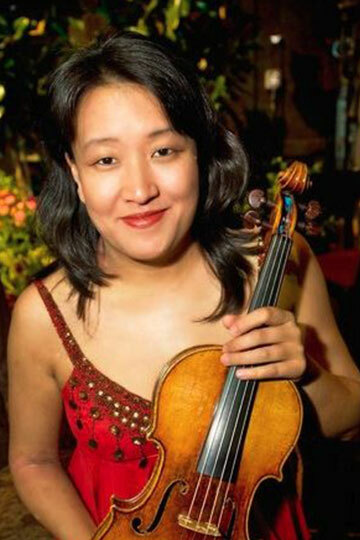 Hae-a enjoys performing in a wide variety of settings, as a soloist, with her string quartet at private events, with the Richard Brown Swing Band at large social events, and as a regular substitute with the Houston Ballet and Houston Symphony orchestras.